Though more than two years went by without me updating this blog, during that time I received lots of emails from readers, which was super nice – I always love hearing from new friends! And during that time, the majority of the emails were about one thing. Could I recommend some restaurants in Las Vegas? Seriously, I have received countless emails in the past few years asking me for restaurant recommendations for Vegas. I figure some of you may also be interested in this list, so I’ve expanded on it! My number one recommendation is Craftsteak. I tell everyone about Craftsteak. It is my favorite restaurant outside of LA and trust me, I go to a LOT of restaurants. #opentableVIP It’s an upscale steakhouse owned by Tom Collichio (of Top Chef fame, who can GET IT by the way) located inside MGM and the food is just fantastic. Usually, we are only in Vegas for a weekend, which means two dinners – we ALWAYS go here for one of the meals. The menu is super seasonal and changes virtually every day but I can tell you what we get everytime I go with my mom – a couple oysters to start, the charcuterie platter with pretzel rolls (which is a thing of BEAUTY), occasionally the heirloom tomato salad if it’s spring or summer, the hanger steak medium rare, and the mushroom assortment as a side. That’s our standard order and it’s unreal. Other things on the menu that are really delicious: the Persian cucumber salad (also seasonal), Caesar salad with anchovies (Rami’s favorite), wagyu tartare, their french fries with paprika and vinegar, monkeybread for dessert (I think I have had this only twice because usually we are so full from dinner), and they make a mean mojito. You really cannot go wrong here. It ain’t cheap but it is DAMN good every single time. For Italian, my top recommendation is Carnevino, inside the Palazzo. Carnevino is a Mario Batali restaurant and we all know that man knows Italian. I have a soft spot for Carnevino because my favorite slot machine is right next to it so altogether the two make for a very happy Jord. I like that at Carnevino, the pastas come in truly Italian portions, meaning not huge, so you can get one for a starter if you’d like rather than a main course. I have had many of the pastas over the years and my favorites are the ricotta and egg raviolo with brown butter, the sausage orecchette, and the spicy spaghetti fruitti di mare (with seafood). They are also known for their octopus, which is out of this world, and their meat (carne means meat!) – I recommend the veal scallopine or sweetbreads, or if you’re winning at the blackjack table, the porterhouse steak. For a great brunch, I recommend Yardbird, between the Palazzo and the Venetian. We all know how much I love the south and this place is just too cute. 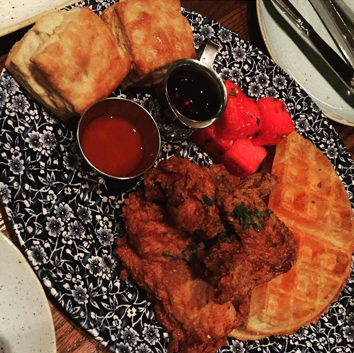 My mom loves chicken and waffles and they have a great one – I am partial to the shrimp and grits, but whatever you get, do not miss the biscuits or the fried green tomato BLT! They also serve lunch and dinner but I kinda like starting my day off with a biscuit and a sweet tea, Vegas style. The family that eats fried chicken together stays together? If you are brave and want to venture off the strip, you MUST go to Lotus of Siam. It’s known as being one of the best Thai restaurants in AMERICA and it’s randomly in a slightly seedy stripmall about 10 minutes off the strip. Great for groups (they take reservations! ), great wine list, a lot of super spicy dishes, and everything is delicious. You can get your pad Thai, but this is the place to be more adventurous! I recommend the garlic fried prawns, nam kao tod (crispy rice salad), Chilean sea bass with drunken noodles, and braised short rib with coconut curry sauce. YUMMMM. Best view on the strip? Mon Ami Gabi, inside Paris. Sit on the patio and you’ll have a great view of the Bellagio fountains. Order the moules frite (mussels with french fries) and thank me later. Great burgers? I enjoy Holstein’s, inside the Cosmopolitan, for delicious, inventive burgers, fries, and amazingggggg milkshakes – some of them with booze. Milkshakes at Holsteins after Britney! Good for a group? I think tapas is always fun when you’re with a group – I like Julian Serrano inside Aria, and Jaleo inside the Cosmopolitan. I also have gone to Sushi Samba inside the Palazzo with a big group and we had a great time – I’m not the biggest fan of sushi in Vegas (since sushi in LA is so good), but most of their menu is good. Pretty food in a pretty place? 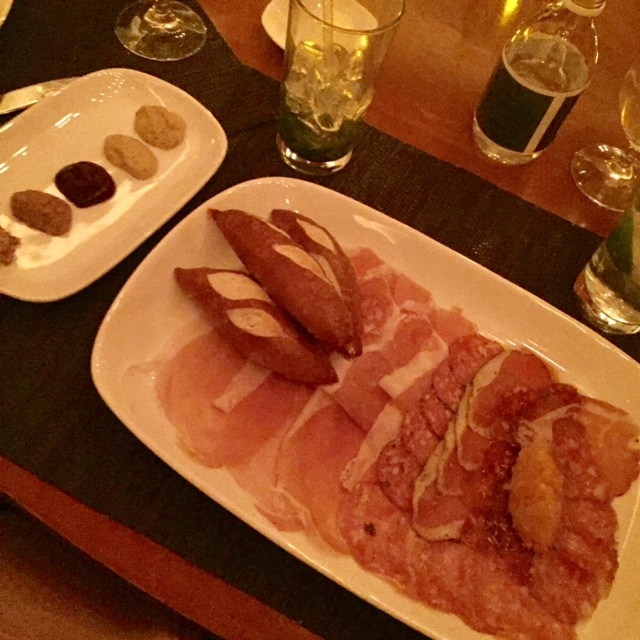 You’ll want to go to Giada. It has mixed reviews but I have always enjoyed my meals there and the decor is GORGEOUS, with an amazing view overlooking the strip! Small portions, though, so be warned. I like their chicken meatballs, their shrimp with lemon spaghetti, and their charcuterie plate. Plus there is a photo booth! Fun! I hope this list helps you plan your next trip! Let me know if you have any questions or want some more personalized recommendations. Viva Las Vegas ya’ll!